The Alcatel OT-980 is one of quite a number of Android handsets hovering around the £100 mark. It does have a distinguishing feature in its slide-out keyboard, but it is let down by a poor camera and shortage of internal storage space. Alcatel makes no bones about the aim of the OT-980. This handset is about the mass market, and its £99.95 pay-as-you-go price from Carphone Warehouse indicates that it is a pretty affordable option as far as Android is concerned. 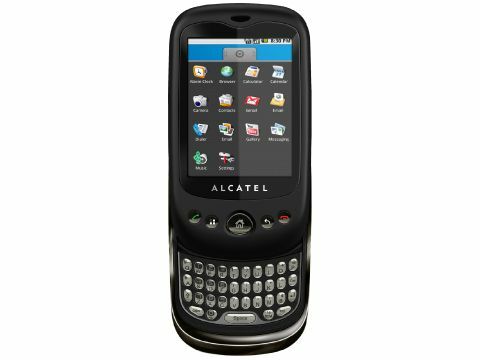 Still, it is a 3G handset with Wi-Fi, and GPS, and while it is more closely related to the LG Optimus GT540 than the HTC Desire, it is Alcatel's flagship model. Not content just with pushing at the price barrier, Alcatel has come up with a novelty in hardware design too. This is a slider phone, and there's a full QWERTY keyboard available for you to tap out text to your heart's content. We've seen another slider recently, RIM's BlackBerry Torch 9800, and before that the Palm Pre Plus crossed our, er, technological radar, but this is a budget offering in a very different category. One of the inevitable things about sliders is that they can be chunky old devils, and the Alcatel OT-980 proves the point. It is very thick indeed by modern standards, with no less than 15.9mm of waistband to wrap your hands around. This girth means that even though the Alcatel OT-980 is only 60.4mm wide, smaller handed people might find it difficult to reach right across the screen for one handed use. Another thing about this style of mobile is that it can get mighty tall when you pull the keyboard out. In this case, the standard height of 112.5mm mushrooms to about 150mm when you unleash the QWERTY. At least Alcatel has got the weighting sorted out, and the phone is not inclined to topple forwards out of your hands as you type away. The black and silver physical design is reasonably pleasant. There is a band of silver running all the way round the edge. It's thinnest on the top edge, and its fattest on the bottom edge where it comprises a good portion of the bottom edge's sloped design. There's a quirkily shaped Home button beneath the screen, along with almost too small to touch Menu, Back, Call and End buttons. If you want the Android search function, you'll have to access it via the screen, as there's no physical button in sight here. The screen looks rather lost in a front fascia that could accommodate a considerably larger display. In the interests of keeping costs down, the screen is a 2.8-inch 320 x 240 pixel TFT job and it does scream cost-cutting at you. The screen resolution and sharpness isn't great, and is the less accurate and more lumpy resistive rather than capacitive option. Side buttons are limited with all sides empty apart from the right one. There you'll find a volume rocker, micro-USB connector and 3.5mm headset connector.